I have recently started working towards keeping shrimp. We keep other terrestrial invertebrates (isopods, mantises, and cockroaches) and thought that shrimp would pose an interesting new challenge. With our mantises, we have focused on bioactive vivariums that include a cleanup crew, microfauna, and plants. That isn't the norm for mantises, but it is almost a necessity in the shrimp-keeping hobby from what I have seen. 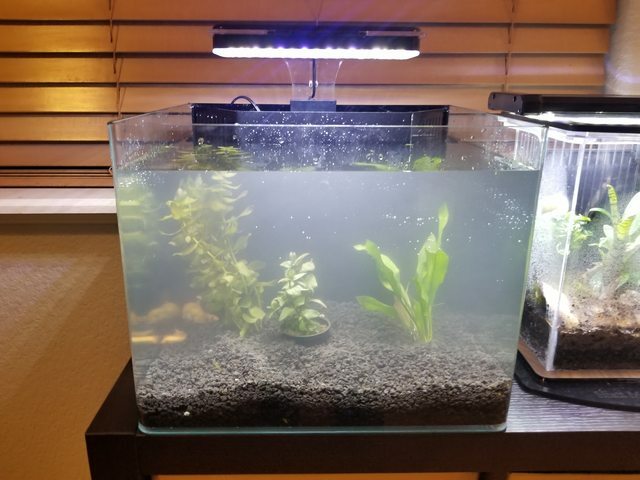 We intend to take the same approach, including heavily planted tanks, shrimp, snails, and possibly some mosquito rasboras if we are able to establish our shrimp well. I have some experience with aquariums through helping my dad, who has had several freshwater and saltwater aquariums. That said, shrimp are completely new to us. My goal is to establish two shrimp tanks, a 7 gallon and a 1 gallon. I understand that smaller is harder. Started with the Imagitarium 6.8g rimless tank from Petco. Modified the filter system to include more biomedia and a more powerful water pump. Using Eco-Complete for substrate since it is widely recommended for planted tanks and shrimp look better on dark substrate from what I read. Using Mopani wood as our primary hardscape. We soaked it for several days prior to adding to the tank, but it continues to leech some tannins. Bacopa as a background plant. S. repens as a mid-ground sort of plant. I plan on letting it create bushes more than creating a carpet. Micro-sword for a foreground carpeting plant. I would like to add a little dwarf water lettuce but haven't yet found a source. Our plants are notably lacking moss, which I read is preferred for shrimp. 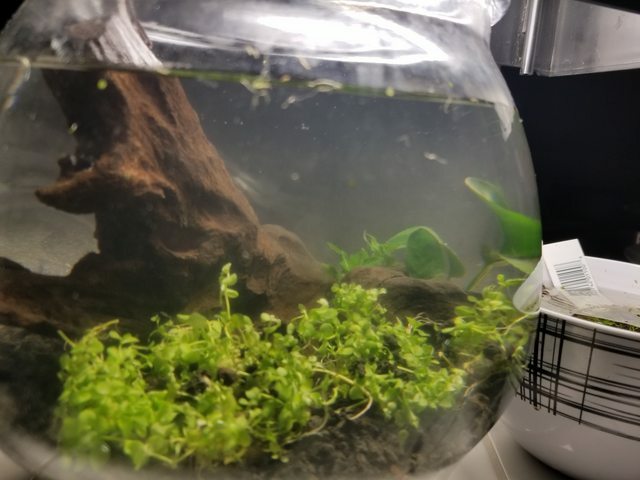 We may end up adding a little java moss but I am hoping the micro-sword will give them enough surface area to be happy. Once cycled, we will be adding shrimp. We are likely going to get blue velvets, starting with 10-15. Once the shrimp are added, the fish will be moving out. To start out, we are working on cycling the tank. We used some stuff from an established aquarium and added Safestart+ to kickstart the bacteria. Keeping the tank at about 78F with a few Zebra Danios and two mystery snails to keep ammonia going while the bacteria gets established. We are dosing Prime and doing daily water changes to keep the temporary inhabitants happy. It was started about a week and a half ago, and while we aren't seeing ammonia dissipate like we want, it is steadily working. We don't plan to add shrimp until we have 0 Ammonia and 0 Nitrite. Originally planned on it being a no-tech tank, but decided I would be happier with some water movement and filtration. I designed a custom water pump sponge filter. 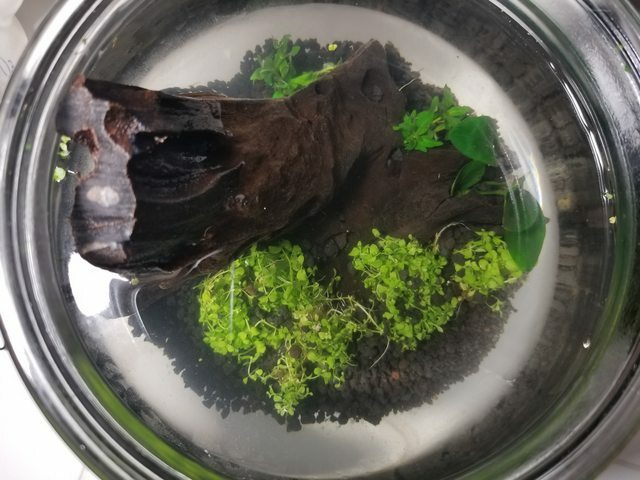 Using Malasian driftwood for hardscape. Sticking to fewer plants for this build to stay more organized. Monte carlo planted in substrate for carpet, and a monte carlo mat to cover up the filter. A little bush of s. repens. A small bit of anubias nana. Would like to add a floating plant, but havent been able to source any. 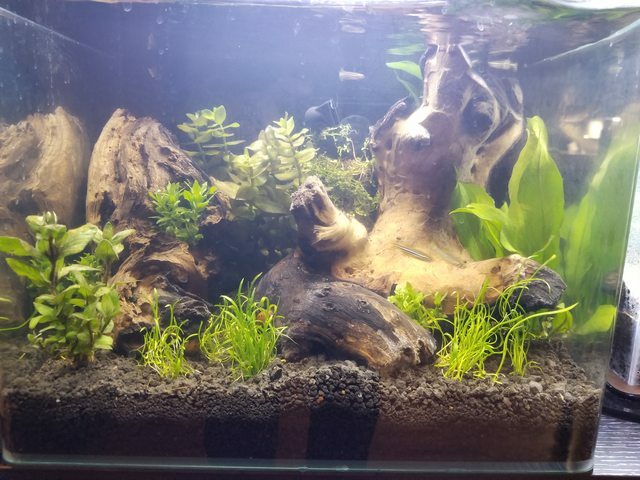 Once cycled, I will be adding shrimp. Planning on 5 RCS or orange rili to start. Cycling this tank has been much harder so far. We added some Safestart+, but have not seen any real progress yet. I am keeping two small nerite snails in here to create the ammonia, feeding them since algae hasn't established. This tank will be much more of a custom project for us. 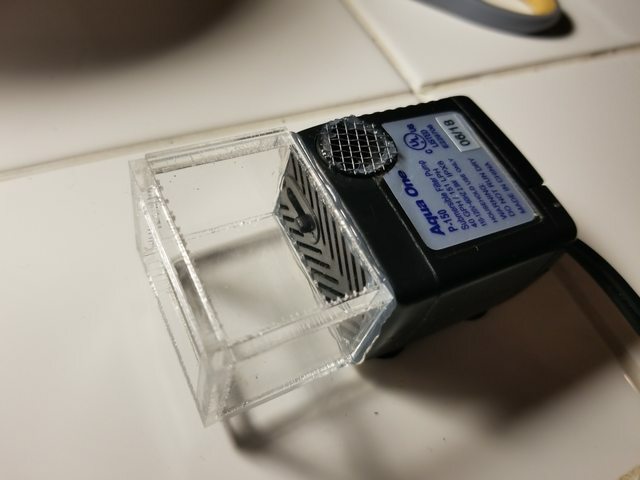 I designed and built a 1"x2"x3" large water pump sponge filter to help the water stay a little more clear and give the bacteria some flow to process the ammonia. For the lid, we are also going completely custom, designing an acrylic and wood lid with built in lighting and containment for floating plants. We have a laser cutter and CNC so it is fun to have the lid be a separate design project. My goal with the lights is to have too much light available, and the ability to dim. That way we can grow the plants but turn down to reduce algae problems as needed. This tank will eventually go on my desk at work. Since it is a pretty professional environment, it is important that this tank isn't noisy or technical looking, and is attractive for client meetings in my office. There is a rather small available footprint which is why we went with the 1-gallon, even though it will be more challenging. So far, it looks like we are getting a little nitrite, but its slow going. Doing daily water changes and dosing Prime so we don't kill off the snails. Here is the custom filter. The sponge media goes in the acrylic cage, and water is pushed out the grated hole. It fits neatly behind the driftwood and is not visible except from directly in the back. The top is covered in a monte carlo mat to hide it better. Here it is set-up and slowly cycling. We are temporarily using a CFL hood for the light to keep the plants going well. It also raises the water temperature to about 75F, not very high for establishing bacteria. I already received some good advice from @jayc regarding how the temperature needed for Zebra Danios is lower than the recommended temperature to get bacteria growing quickly. I am hopeful that with some patience and careful monitoring, the danios will stay healthy and the bacteria will get going. I have read many articles about fish/fishless cycling and do not plan to change to fishless for this build. Any comments or advice appreciated. We are taking it slow, but are getting excited for cycling to complete so we can start adding shrimp. UP Aqua Shrimp Sand - fake product??! Downgraded formula? I recently bought some from Tech Den (Australia). It was a larger size, about 2-3mm, and looked a little different. It came in a vacuum-packed bag, instead of loose in a regular bag. I figured it's just the larger size that I have heard about, but that it would be basically the same. Not! Within 90 days most of it has disintegrated to dust. Stirring up the substrate produces dense, heavy clouds of 'smoke' - the disintegrated material. It's a disaster. Also the water chemistry is not quite the same. OK, but not perfect like before. Has anyone else experienced a change in this product, or know whether there is a fake version around? Do any Australians here know where to buy the good 1mm UP Aqua Shrimp Sand, in the ordinary (non-vacuum) bag? The trials, tribulations and (hopefully) sucesses of new shrimper! To save me starting multiple threads and also so I know here to find answers I am doing a journal/question thread. Sorry.... this WILL be long probably and I appreciate any time you take to read and answer my questions! So, on Thursday (edit: tomorrow now according to an email from AU Post) I have a package coming from The Tech Den with a Aquael Shrimp Set Smart 30 and a few other goodies. My old 16L (does not fit in spot and wary of using for fish since it housed mice) has been a bit of a dummy test on water temps and for the last week has been in a safe range. None of these have been 40+ days though so I will probably need to air-con or get a cooler for coming into next summer.... or something (nowhere near planned this part since should be cooling off by time cycled). My local has glass shrimp (Australian... soooo Paratya australiensis?) who looked blue tinged at least, cherry red and cherry yello but no source of cherry blue. Would appreciate sources to get from Newcastle or Sydney! Gumtree makes me hesitate though I have found people with them up on there. One seems a safer bet but maybe not as easy to get to. A second one has potential and very easy for me to get to for Newcastle (no car). - Now... going with plants that don’t need a planted substrate.... should I still actually go with an actual buffering/planted substrate for bacterial reasons...? Should I add hidden biomedia sock or anything like that since the bacteria won’t really colonise in a thin layer of sand, unlike a planted tank. Starting to get into the excited but freaking out I am doing something to mess it up bad stage. I have been a long time lurker on this forum and have learnt a lot from past and present members who have contributed to this forum. Thank you. This is my first 'real' post and I hope this would help anyone who might be considering building a rack themselves. As requested by @Disciple, hope this helps you too. Just a bit of background on my experience. My only previous build attempt was for a stand and sump for a 4x2x2. It was my first build dabbling with staining wood and using silicon for sump baffles, etc. As you can see from the photos below, they are pretty amateurish but I am happy for how it turned out as a first attempt. Next step is to fit some doors to it. Anyway, this gives you an idea of the level of experience I have before I embark on my ambitious attempt to build a rack. Below are some photos of my 4x2x2, sump and stand build, and some of its inhabitants. Sorry they are not shrimp related and not of great quality taken using my phone. With background in place and tank inhabitants added consisting of altum flora discus, german blue rams, panda corydoras, cardinal tetras, otocinclus, red cherry shrimps, darwin algae shrimps and darwin red nose shrimps. German blue rams with their fry. I have browsed many build threads including some from here and have built on my ideas collectively from different sources. The specific post from @BlueBolts here: http://shrimpkeepersforum.com/forum/topic/1415-breeding-rack-no2/ has inspired me greatly and I would like to acknowledge that. This rack will be located in the lounge room so it has to be 'display-ish' quality and light from it must not interfere with the TV or be too blinding to people sitting around the lounge room. Also, no unsightly hoses/pipes are to be seen. I managed to convince the Minister for Home Affairs that a canister filter and chiller by definition, is not categorised as hoses or pipes, and would be in no way unsightly. The LED display from the chiller would provide subtle mood lighting, and the gentle humming of the filter and soft soothe whirling of the chiller fan would be therapeutic for lounge surfers, and would also greatly enhance movie watching experience with enriched sound depth and effects. Hence I received approval to have a canister filter and chiller located next to the rack. I used 5 x 5.4m long 90x45mm MGP10 untreated structural pine bought and cut to size from Masters for $83.75. I find Masters generally sells timber cheaper than Bunnings. Since I have both of them close to where I live, I selectively buy what I need from where it is cheaper. The frame is held together by 10-8 x 75mm zinc plated countersunk screws. I bought a box of 250 screws from Bunnings for $27.50. The rack measures 1390 x 420 x 2200 mm (L x W x H). The plan is to hold 2 x 2'x15"x15" tanks on the top and middle tier each, and a 4'x15"x15" hospital/quarantine/grow out/sump tank on the bottom tier. Each tank would be insulated by 20mm foam around the sides, back and base as I plan to run both tropical (28-30 degrees C) and chilled (22-24 degrees C) tanks on this rack. Plumbing for air and sump would be hidden within the frame. Please disregard the mess in the background. Still sorting out stuff in the garage after the move. As some of you know, my currently my set-up looks like this. With enormous amount of help and encouragement from my fiancee, we have now got the fishroom to this state. Amazingly for me things have not stop improving here! We are in the process of building a new house and getting a purpose build fishroom in it. The construction started just before Christmas last year. In this fishroom I wanted to have some of the things I wished I had or I had done in my current set-up. I wanted to be able to keep the room warm in winter and cool in summer with minimal power consumption. Living in Canberra we get cold winters (nights especially) and a week or two of extreme heat every summer. We decided to build the the whole structure; house and fishroom, with a relatively new building material suggested to us by our builder. It is a thermal facade system called 'Exsulite' it is manufactured by Dulux. It is a system that uses foam, foil, airgaps and various boards. It provides a lot better thermal protection than regular bricks for example. Between this system and the gyprock regular insulation batts are fitted. The whole house including the fishroom and the garage has insulation batts on the ceiling as well. I also decided against a door that opens to outside and windows to minimize heat loss through these. I wanted to make sure I had all that I needed within the room in terms of access to water as well as getting rid of waste water. I decided to have a 42L laundry tub fitted into the room to provide all important 'cleaning' station. I no longer need to take over the laundry or worse the kitchen during certain maintenance of various fishkeeping related items. I have also got a separate tap installed next to the laundry tub to have my water reservoir line to be permanently connected to this tap. I won't need to connect and disconnect this line unnecessarily in the future. A center drain in the middle of the room was also a must. As with almost everybody that is in the aquarium hobby, I always found I needed more power points than what is available around the tank/tanks. This always inevitably leads to using of powerboards, but even with using quality ones there is always potential to overload or something to go wrong. As much as possible I wanted to avoid using power boards and double adapters in the fishroom, though I know resistance is futile and I might resort to these at some stage. I am getting the power points put in two lines; one over the other. One line is going to be connected to a wired timer. These power points are for the lights. The second line is ordinary points for various other equipment. The electrician have put another box and 3 circuits in this room alone! As already mentioned, will be lighting all my tanks relatively well by fishroom standards. I do not see the point of having a fishroom where you can't see the inhabitants of the tanks very well. Each row of tanks are to have LED lights fitted above them. I have recently been replacing my T8 fluoro units with these. I am finding this is saving me a lot of energy. As I have been known to leave smelly things in the fishroom; like a bucket of blackworms that have died, it was super important for my fiancee that the room can be easily ventilated! This was something I wanted anyway as the room has no windows and no access to outside aerating the room is not possible. We are getting a toilet/bathroom style exhaust fan installed in the room. Its a type of model that has flaps that close when not in operation providing no gap for heat loss. The room is getting two ceiling flouro lights as well, for the times I might walk into the room when the tank lights are off. That's about the progress so far. We are still couple of months away from completion. My new project awwww yeahhh. 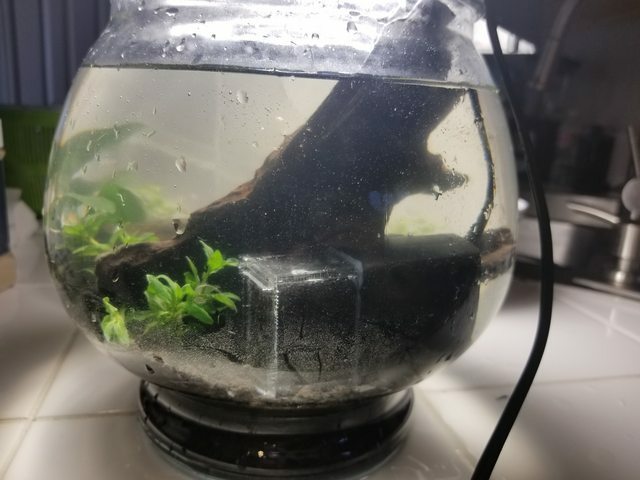 Ive been getting right back into shrimp in a major way now, Had a few days spare so I got around to re-sealing an old tank I had laying around and building a quick stand for it. This is being setup as a shrimp/ low tech planted mostly somewhere for all my anubias to live I have some rather large varieties now, just some lava rock as the main hardscape, then course white sand, lots of ferns etc. standard aquaone heater, and the filter I'm running is an aquaone 1050 series ii. It's quite new I got it on the cheap ages ago and it's sat there lol. The tank was already drilled through the bottom panel from an older project, so I decided to run a closed plumbing system which seems to have stopped the notorious dead spots you sometimes get in tanks bigger then 4ft. And it's working great with only a relatively small filter.